Bishop Cyril Milner has started his 46th year of ministry at St Paul’s Free Church of England in Darbishire Road, Fleetwood. He has a special place in countless Fleetwood homes – mine included. For over the years he confirmed and married me; baptised, confirmed and married my two daughters, christened six grandchildren and officiated at the funerals of two grandsons, my father and grandparents. As a minister he has been involved with families at times of deepest sorrow and greatest joy. In fact his records show that since his arrival in Fleetwood in September 1947, he has conducted 5,800 baptisms, 2,161 weddings and 750 funerals – in addition to normal church services. “It’s been a privilege to serve,” he said. Born in Manchester, Bishop Milner trained at Emmanuel College, London, and served 3-year curacies in London and Birmingham before moving to Fleetwood. “I never expected to stay here so long. But, besides liking the church and people, we found the town ideal for bringing up our mentally handicapped son, John. “In the early days, John (now 42 and living in a community home in Fleetwood) had convulsions. He was in a wheelchair and we found shopping easier with the town being flat. “And the fact that the church and rectory were adjoining meant I was on hand,” he added. And so the Rev Cyril Milner, wife Ada, daughter Christine and son John settled down to life in Fleetwood. “There have been changes over the years. I started the traditions of Christmas and Summer Fairs and the election of a Rose Queen,” said the Bishop. “But I can still remember going into St Paul’s the day after we moved in. “The church was built by the congregation as an act of faith and I felt I had a personal commitment to keep it going and maintain it and entrust it to future generations. “And I think, so far, we have done that over the years. A widower since 1984, Bishop Milner is now 76, and has five grandchildren. “But I definitely have no plans for retiring,” he said. 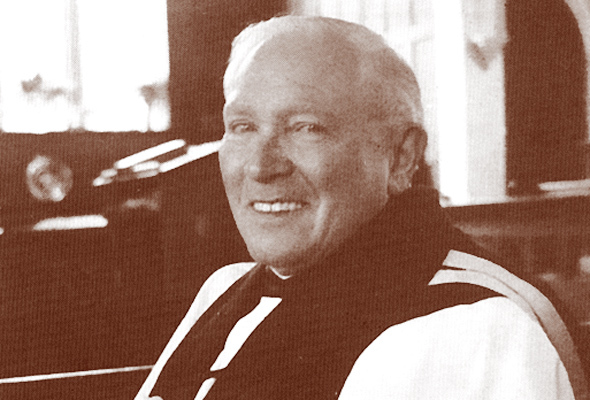 After being made the Bishop of the church’s Northern Diocese in 1973 Bishop Milner was later asked to become the church’s presiding Bishop. His consecration as Bishop Primus was in St Paul’s in 1975. The extra duties mean Bishop Milner conducts confirmations and consecrations throughout the North of England and presides over all the church’s business at meetings in London. Through the Bishopric he was invited to preach in America before 4,000 people in Charleston, Atlanta – an experience he won’t forget! “I care for my ministry and do it to the best of my ability. I am a workaholic and work some part of every day – if not all day. “Forty-five years in one church is a long time – an incredibly long time. I’ve heard it said that Cyril Milner is St Paul’s and St Paul’s is Cyril Milner. “I suppose in a bit longer you can add ‘… and ever’ to that! “I am now marrying girls whose grandparents I married. So there has been continuity at St Paul’s. “I have put myself out for people and generally it has been appreciated. “Preaching has been an important and favourite part of my ministry and I also like the administration involved. “I like my churches to know I really care about them and that I am approachable. “As I look back I want to thank God for 3 things – for the family into which I was born, a loving family; my wife and the family we had and for the health and strength I have had. Bishop Milner also paid special tribute to the church officials who had served over the years. “I have been supported by some very active, loyal and devoted members. In his September Newsletter Bishop Milner says the years have been crowded with happy privileges, staggering responsibilities and an innumerable company of rewarding friends. Preaching, he says, has been a sacred duty and a great joy. He adds that his prayer for St Paul’s is that members keep the banner of faith flying so high that others may be made brave and come and stand at their side. First published in Life in Fleetwood issue 25, October 1992.